Here I am, fiber artist, beginner MFA graduate student, lover of mountains and quilts, learning the “digital humanities” in the very very (very very) cold basement of Temple University’s Paley Library. 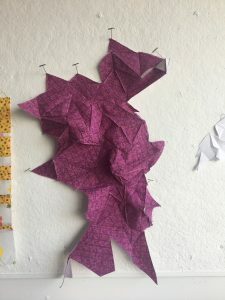 Currently, it means a multi-step process that eventually leads to a three-dimensional stiffened fabric version of a topographic map (at least, for now). 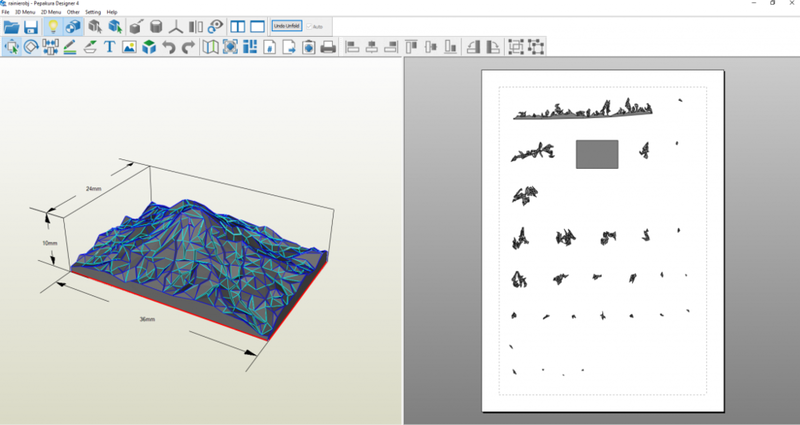 Discover Sightline Maps, a website that will create digital 3D models of already existing terrain from Google and send it to you as an .OBJ file. It should be noted that there are probably lots of ways to acquire this data. I found Sightline to be simple and user-friendly so I stuck with it. You just make a box around the area you want for your model and press go. It spits out the model in an email. Sightline is free but does require creating an account. Play with the model in Autodesk Maya. This 3D modeling software is pretty complicated but I found watching tutorials and asking staff at the DSC for help (thanks Jordan!) was enough to get started. There are a lot of things you can do in this software but the most important one is to make the triangle count smaller so that Pepakura can read it. This is done by first “cleaning up” the model (mesh>cleanup), and then reducing triangles (mesh>reduce). You can set the triangle count to any number you want, but I found that something between 500 and 5,000 will be easiest to manage in Pepakura. More triangles allow for more detail but that also means it’s more complicated. How much detail are you willing to give up for the sake of simplicity? Maya offers a free 1-month trial as well as a free 3-year license to educators; otherwise, it is not free. Play with the model in Pepakura, a very fun and free software (that only works on PCs!). Pepakura will turn your 3D model into a flat pattern. As a person who likes to work three-dimensionally with fabric, a program that will create a flat pattern of a 3D object is very useful. Game. Changer. At this point I ended up with a print-ready PDF of my mountain range. I projected that flat pattern PDF onto fabric that had been stiffened with interfacing and traced all the lines. Pepakura is meant for making things in paper. It gives you cut lines and mountain and valley folds. I sewed all the “fold” lines by doing right sides together for a valley fold and wrong sides together for a mountain fold. Final step: celebrate by writing a blog post about it!